tested and evaluated in a cost effective way. requirements along with compact heat exchangers. a. Commitments for 2016-17 : Rs.43.00 Cr. b. Cash Out Flow for 2016-17 :Rs.30.00 Cr. c. Planned Commitments for 2017-18 : Rs. 82.00 Cr. proposal s r e c e ived from DRDO i s th th completed on 12 and 13 of July, 2016. Tapas BH 201 also known as @DRDO_India Rustom II. Incompetency, import pasand and blame games in all places. The OFB is piqued over the Army’s decision to use a different process of qualification, vis-a-vis foreign manufactured artillery guns, with additional trials (termed as user exploitation) being introduced for the first time in the case of Dhanush. They draw a comparison with the 155 mm .52 calibre tracked self-propelled K-9 Vajra (Thunder) gun system from Korea that was accepted by the Army after just 200 to 250 rounds, a number which, according to OFB officials, is “too low to evaluate a gun system”. Under extensive three-phase user exploitation trials, three Dhanush guns were fired under desert conditions (around 450 rounds at Pokhran, Rajasthan, and Babina in Uttar Pradesh), three guns were fired at high altitude (around 400 rounds in Siachen) and finally they were fired as a battery of six guns. According to officials from the OFB, “over 1,200 rounds have been fired as part of the user exploitation trials”. And over 3,700 rounds have been fired so far in the present campaign to have the gun cleared. But, according to Army sources, the gun is still some way from acceptance and “has not met all the parameters to enable it [OFB] to go ahead with the order for 12 guns [besides the six that are in the user exploitation trials]”. Indigenously developed light weight Glide Bomb, SAAW (Smart Anti Airfield Weapon) was successfully tested from Indian Air Force aircraft in the ranges at ITR, Chandipur, Odisha. The guided bomb released from the aircraft and guided through precision navigation system, reached the targets at greater than 70 km range, with high accuracies. A total of three tests with different release conditions and ranges were conducted and all were successful. The guided bomb is developed by Research Centre Imarat (RCI), DRDO along with other laboratories of DRDO and Indian Air Force. Raksha Mantri Smt Nirmala Sitharaman congratulated the DRDO scientists and Indian Air Force for the successful tests. Secretary Department of Defence R&D and Chairman DRDO, Dr. S Christopher congratulated the team and said SAAW will be inducted soon into the Armed Forces. Director General Missiles and Strategic System DG (MSS) Dr G Satheesh Reddy said it’s a major milestone in the indigenous capabilities to develop guided bombs. As with earlier tests, an Indian Air Force Jaguar jet will stalk and film the Nirbhay during its cruise phase over the sea. In its last test flight eleven months ago, the Nirbhay veered dangerously off its course approximately 50 seconds into flight, forcing the launch team to flip a switch and destroy the missile over the Bay of Bengal. It was a punch in the gut to a team that had been upbeat about defeating a dogged electro-mechanical problem that had waylaid an earlier attempt. The bad news then was that the December 2016 test was the third of four tests to end with the missile either destroyed mid-flight or failing to meet test requirements. The good news now, as the Nirbhay gets set to fly again off the coast of Odisha at India’s Integrated Test Range, is that the problems weren’t apparently major. That, at any rate, is the hope. Central to the devilry that rolled the missile dangerously off its course was a software glitch that seized the carefully calibrated actuation systems, cramping the weapon’s inertial navigation system. The new launch window, the morning hours over three days between November 7-9, afford the Nirbhay a chance at redemption after two consecutive failures. The missile was first tested in March 2013, a test that failed owing to a component failure, throwing up quality control issues at the prototyping phase. The second test in October the following year saw the 1,000 km range subsonic cruise missile complete its mission without a glitch. The Indian Army has just signaled what could finally be the start to a major contest for the country’s next battle tank platform to replace an ageing fleet of 2,414 Soviet-origin T-72 tanks. The Army this week invited interest from industry across the world to develop of a Future Ready Combat Vehicle (FRCV), an armoured platform that will be the base, primarily, for a main battle tank, but also other fighting vehicles in the future, totaling nearly 2,000 units. The Army hopes to see the first of these enter service in the 2025-27 time frame. The FRCV isn’t to be confused with the similarly large Future Infantry Combat Vehicle (FICV) programme, that involves a contest to build and supply over 2,000 new vehicles to succeed the Army’s BMP-IIs, a contest currently being fought by Indian private sector firms including L&T, Tata, Reliance and Mahindra. The MBT Arjun during full dress rehearsal for the Republic Day Parade 2010. This one definitely isn’t the typical fight witnessed within defence circles. The high-profile fracas over the Tejas fighter aircraft and the more subdued skirmish over the Arjun tank carry with it the potential to define what India is going to do over the next 50 years on its quest for growth, development and prosperity. For over a decade there has been an intriguing war fought in the byzantine maze of defence bureaucracy. Everyone who is anyone has fired salvos at someone who has had a plan or a plane to sell or anything resembling a tank to hawk. But the last one year has been different with the intensely fought battles often spilling over into the public domain. The war has now entered a decisive stage and by some quirk of fate and politics Nirmala Sitharaman is bang in the middle of it. Over the years, India’s convoluted and snail-paced defence procurement process has thrown up several mythical and real stories of corruption involving shadowy foreign operators, Indian fixers and kickbacks to politicians and business houses. For long-time observers of India’s defence and national security landscape, stories of abrupt and mysterious changes in requirements and parameters of defence procurement are par for the course. Such stories have long passed the threshold to alarm or startle the establishment or the Indian people. Within that context it’s tempting to interpret the ongoing battle around Tejas and Arjun as just random shrapnel spewing from a larger battle for India’s lucrative defence market. There are sufficiently good reasons to back up such an interpretation. Every single acquisition for the armed forces from new generation assault rifles for the infantry troops to anti-tank, surface-to-air and air-to-air missiles is going through a skirmish. In a sense, then, the fight around Tejas and Arjun seems to be inextricably connected to this larger battle. India has the dubious distinction of being the world’s largest importer of arms accounting for 13% of the global arms trade. That single fact makes India’s defence market the ultimate honeypot attracting intense attention from all sorts of legal, semi-legal and blatantly illegal shadowy entities and individuals. It’s also true that India has always had an appetite, aptitude and the necessary scientific and industrial base for acquiring, operating and customising state-of-art defence technologies. The Hindustan Aeronautic Limited (HAL)-led DARIN II upgrade of deep penetration strike aircraft Jaguar and the indigenous overhaul of the T-72 tanks with better engines, thermal sights and Explosive Reactive Armour (ERA) are two cases in point. In that respect, the deep interest shown by global arms majors from the US, Europe and Russia to fulfil India’s burgeoning defence needs is understandable. The no-holds-barred fight centred on Tejas and Arjun is as much about the much needed multirole single engine fighters to boost the Indian Air Force’s dwindling squadrons and the critical need to top up the eroding armour strength of the Indian Army, especially when the possibility of a two-front war is real, as it is about India being the goose that lays the golden eggs for the global arms corporations and its ancillary industries. Yet, to confine the intricate and complex battles surrounding Tejas and Arjun to just the defence domain, as most long-time observers tend to do, is nearsighted and does not allow enough light to reach into the multidimensional implications that any decision regarding these two platforms is going to have on how India will develop its manufacturing and industrial prowess in the years to come. Tejas is not just a fighter plane and Arjun is not just a heavy tank. They are representatives – metaphorically and materially – of the densely networked and sophisticated Indian ecosystem that has been in the making for the last 60 years. It’s composed of scientists, engineers and factory workers of different kinds – from material sciences, metallurgical engineering, propulsion systems to inertial guidance systems, software engineers specialising in fly-by-wire software systems and aeronautical engineering. Now, that both the platforms are mature enough to serve the country, after close to 30 years of research and development, they are seen as an existential threat to three inter-linked forces. Two of these forces are quite well known and there isn’t too much of a mystery surrounding them. The first are the foreign defence companies and contractors who have managed to dominate India’s defence procurement process, especially in the last two decades. The second is composed of powerful parts of the Indian defence establishment and their informal network of middlemen, agents and liaison experts who have established a cosy, comfortable and an extremely beneficial relationship with these foreign companies and contractors. Long-time observers and veteran defence journalists know both these forces intimately and how they operate, literally both below and above the radar, and in knowing them so inadvertently tend to look no further. This leads most to conclude that everything defence and military is just that: what you procure for defence forces impacts only the state of military readiness, operational efficiency and our armed forces ability to counter hostile countries and their armed forces. But that’s not true, and not by a long stretch. There is a third force, hidden in plain sight as it may, that has exponentially grown in size and power ever since the economic liberalisation of the 1990s. Composed of a wide variety of thought leaders, think tankers, academics, policymakers and bureaucrats, and former bureaucrats, senior journalists, Big 5 and non-Big 5 consultants – mostly trained in foreign universities, foundations, scientific and engineering academies and multilateral institutions like World Bank and International Monetary Fund – they have over the years come to occupy crucial positions in a whole host of institutions, trade bodies and civil society organisations. This seemingly amorphous group, and I use the word seemingly in all seriousness, is deeply wedded to the idea that India’s growth, progress and prosperity lie in collaborating and entering into partnerships with foreign companies, even on terms that are not conducive for India’s development and growth, global conglomerates, multilateral institutional mechanisms that promote free trade, intellectual property rights and the patents regime and generally being in line with the global economy and its concomitant geopolitics. To a certain extent it is true that India’s economic growth in the last two decades has come from integrating its complicated political economy to the globalised world order where trade, services, commerce and manufacturing are all inter-related, geopolitical and financialised. The problem arises when the idea is converted into an immutable adage, such that it’s touted as a one-size-fits-all solution for everything from eliminating poverty in India to the country becoming a strong manufacturing and industrial power. This third force for various reasons – some above board and many below the board – creates a powerful discourse that puts global market and its mechanisms at the centre of all forms of development and security, including military, defence and national security. This is where the non-military implications of Tejas and Arjun come in. It’s precisely the long-term potential and possibilities of these implications that have caused vicious attacks on both platforms. That’s why the fight about and around Tejas and Arjun is not as much about defence procurement as it is about the pathways that India chooses to use to develop its manufacturing and industrial strength internally. In more ways than one, the fight about the decision to induct all versions of Tejas and Arjun into the armed forces and continue with developing the platforms for the future is going to be a critical make or break moment for prime minister Narendra Modi’s vision about making India stronger and a competitive country on the world stage. It somehow seems appropriate that defence minister Nirmala Sitharaman is in the right place at the right time. To that end, it’s necessary for her to understand and unpack two crucial myths that are being perpetuated by this third force. Sitharaman is a strong woman in every sense of the term, but there are two interesting aspects to her. The first is that she once worked with PricewaterhouseCoopers (PwC), an organisation that is a leading advocate of a globalised model of development. The second is that she has studied quite extensively in Jawaharlal Nehru University (JNU) acquiring a master’s degree in economics from an academic institution that is often considered the intellectual powerhouse of a worldview that wants India to adopt a more self-reliant model of growth and development. Only time will tell which aspect she chooses to asserts and will be allowed to choose to assert. The first myth that’s continuously perpetuated is that both the Tejas aircraft and the Arjun tank are sub-par systems, obsolete, underpowered and not really indigenous. This myth is perpetuated by media organisations, journalists, experts and several serving and retired bureaucrats and armed forces officials. In short, the point that’s repeatedly pounded into our collective consciousness almost day in and day out is that the Indian defence industry – notably Hindustan Aeronautics Limited (HAL), Ordnance Factory Boards (OFBs), Aeronautical Development Agency (ADA), Electronics and Radar Development Establishment (LRDE) and Defence Research and Development Organisation (DRDO) and its several laboratories – lacks the bite and the muscle power to protect India. While that narrative may have some grains of truth and that too in a few specific cases, it’s substantially inaccurate in the case of Tejas and Arjun. While there are many logical inconsistencies that could be pointed out that fundamentally and irrevocably break that narrative, there are two pointed instances – one of Tejas and one of Arjun – that Sitharaman might find beneficial to keep in mind whenever she listens, reads or is exposed to that dominant narrative and its thought processes in one form or another. The two instances, needless to say, have been underplayed by the mainstream media to such an extent that only handful are aware of it. The first was Tejas aircraft’s international debut that took place at the Bahrain Air Show (BAS) in January 2016. The fact that it happened against the backdrop of a sustained and dirty campaign to scuttle the aircraft’s participation goes on to only show how afraid the entrenched lobbies are of the potential of this aircraft. Such was the impact of the move to field Tejas at BAS that China and Pakistan at the last minute withdrew their new multirole JF-17, an aircraft that they have been hawking as a replacement to nations that cannot afford the legendary American F-16. When seasoned international aerospace journalists saw the practice runs of Tejas, where Commodore Jaideep Maolonkar, Chief Test Pilot at National Flight Test Centre (NFTC), and Group Captain Madhav Rangachari, effortlessly kept pulling 8 ‘G’ and beyond, the Twitter world was engulfed by waves being created by this new and relatively unknown aircraft. Such was its performance that several of the veteran journalists called it ‘the best’ that they had seen in years. The most interesting and eye-opening impact was revealed to me a few months back by a senior Swedish engineer working for SAAB, the company that makes the multirole fighter Gripen. It seems that Tejas’s performance at the BAS, where Rangachari actually pulled a 9 ’G’ manoeuvre (a golden standard), stacked up enough points for the Swedish company to prepare an internal comparative evaluation of the two aircraft for use for presenting Gripen to Indian policymakers. He also revealed that there were strong rumours that the Americans got so spooked by positive reviews that they actually asked two EA-18 growlers – a specialised electronics warfare variant of F/A-18 – to take to the air from a nearby base at the precise same moment as Tejas demonstration to evaluate its performance. The long and short of it is this. International air shows are like the ultimate ground for showing off the potential and the flight and fight envelopes of aircraft. No one spares a shoddy performer: just see the grief that F-35 has to go through at every single show. To see Tejas coming out with flying colours and more, and to see the mainstream media practically ignore it, at the very least points to the need to take the continuing criticism of Tejas from powerful quarters with a healthy dose of scepticism. More so now that the Singapore defence minister, alarmingly for all those who have been painting Tejas different shades of black, after flying the aircraft found it nimble, world class and an absolute delight, like ‘driving a car’ as he put it. There is at least one historical precedent to this kind of a concerted smear campaign in India. That campaign also had to do with a fighter aircraft. Not many know that India’s first home-grown fighter aircraft is not Tejas but the Marut HF-24. That aircraft also faced similar – in fact, the same – criticisms as Tejas, with just about 170-odd aircraft inducted into the IAF after undergoing a lengthy Initial Operational Clearance (IOC) and Final Operational Clearance (FOC) process. The criticisms were swallowed hook, line and sinker by the Indian defence bureaucracy and the policymakers went down the import route bringing in British Jaguars and Russian MiG-21s. Very few know, and fewer care to remember, that the much maligned Maruts did a fantastic job at the Battle of Longewala in the Indo-Pak 1971 war. By then, that performance just didn’t matter as the Marut had long been murdered in cold blood by the same set of forces that are now after Tejas and Arjun. Arjun has had to face criticism that’s been as stinging as Tejas, but for a much longer duration. The tank has been called bulky, despite its latest MK2 being 67 tonnes, which is less than the US MIA2 Abrams’s 72 tonnes, almost on par with Israeli Merkava’s 65 tonnes and the German Leopard’s 63 tonnes. To its credit Arjun is as fast, and in cross-country conditions faster, as the three tanks mentioned above. Every tank expert worth his salt considers Abrams, Merkava and Leopard, along with the Russian T-90S that is also customised and produced in India by the Avadi Heavy Vehicle Factory as T-90M Bhishma, as the world’s best tanks. Buried deep within the folds of this dominant narrative lies a story – a startling incongruity – that has practically been ignored by the mainstream media and the world press for more or less the same reasons for which Tejas’s performance in BAS has been brushed aside and deliberately subdued. Arjun has been constantly sniped at by the powers that be at the Indian Army and significant parts of the bureaucracy. Things came to a head in 2010, when both the Army and the defence bureaucracy could no longer ignore Arjun and its performance in trials conducted by DRDO. Underestimating the challenge of Arjun, an overconfident Indian Army seeking to go for the kill set up comparative trial at the Mahajan test ranges located near Bikaner in the Rajasthan desert. The trial pitted 14 Arjun tanks against an equal number of India produced T-90M Bhishma. It must be mentioned here that the Russian tank, while a Main Battle Tank (MBT), is much lighter than Arjun at 58 tonnes. It must further be mentioned that the Russian tank doctrine emphasises mobility, firepower and nimbleness over heavy armour protection. Over a week of testing across three parameters of driving long distances of up to 150 km in really hot conditions, shooting on the move and stationary shooting at targets with pinpoint accuracy, Arjun tanks outperformed T-90S by substantial margin. With this shocking and unexpected result, the trial test report somehow ended up becoming secret with the Indian Army and defence bureaucracy stalling its release. Of course, as the dice rolled, the report did get leaked by one intrepid journalist who will not be named here for obvious reasons. The report only reinforced and reiterated the earlier assessment of how thorough the testing process was and how comprehensively Arjun won the battle. Yet this superior performance of Arjun did not stop the smear campaign and it has continued for the last seven years. For long-time observers, who want to look carefully, there are other straws in the wind that suggest that Arjun is not only a threat to many within India, but also to several outside the country. Last year, one Chinese military think tank known for its close links to the People’s Liberation Army and tasked with modernising the Chinese approach to tank warfare and strategies did a comparative evaluation of its latest tank Type-96B with other tanks from around the world. Arjun was introduced into the mix at the last minute as the insistence of a senior Chinese general. The simulation results shocked the think tank and the PLA, so much so that in a rare public admission on television a Chinese tank expert lauded Arjun to be a better tank and on par with the Israeli Merkava and the German Leopard, arguably the best tank in the world. The recently concluded International Tank Biathalon in Russia is another such straw. There was intense lobbying by Russian officials to make India field its Arjun tanks: 124 MK1 tanks have been inducted into the Indian Army. The official reason given was that the Russians wanted tank diversity since most the countries participating in the tank biathalon were using Russian equipment, especially variants of the T-72 tanks. India has also been participating in the tank games for the last couple of years using its variants of the T-72 tanks. These games are considered to be the equivalent of Olympics for tank crews and commanders. The Chinese were also extremely keen for Arjun to participate since they have been using their top of the line Type-96B in these games. To China’s credit, Type-96B in terms of sheer quality has kept pace with some of the best tanks that Russia and the world has to offer. The eventual difference between the winning and losing crews, especially as far as competition between China, India and Russia was concerned, was in terms of crew training, familiarity with the course and the equipment that they were using. Both the Russians and Chinese had heard enough good things about Arjun to lobby the Indian government hard to get them to participate. The Indian Army was reluctant, but the then defence minister Manohar Parrikar put his foot down. An extremely petulant Indian Army entered the contest with India to be represented by two Arjun MK1s to be drawn from the 75th armoured unit stationed at Jaisalmer. An excited DRDO started the modifications like strengthening undercarriages and removing the explosive reactive armour (ERA) packs to increase mobility required for the games. But Parrikar become the Goa chief minister and the defence ministry was temporarily under Arun Jaitley. 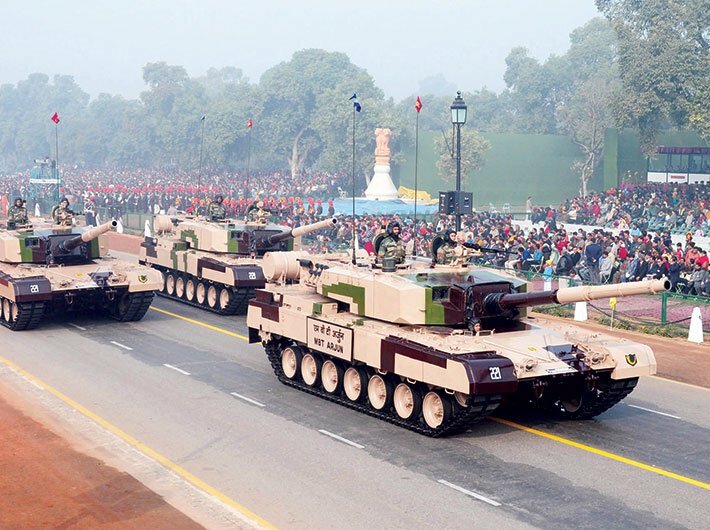 The Indian Army immediately nixed the plan to send the Arjun tanks and instead sent two T-90M Bhishmas to represent our country. To be fair, the T-90M performed creditably and quite well and the Indian Army tank crew, at one point, was actually leading the biathalon. However, both the T-90s broke down and India was knocked out. The point here is not about the T-90M, which are excellent and robust tanks, but it is about how Arjun, which in every respect seems to be better than the T-90M, is not allowed to showcase it strength and potential. In some ways then, Arjun seems to be Karna of modern India, such a whimsical twist that it puts irony out of shape. In understanding and unpacking this particular myth, Sitharaman may well come to the conclusion that Tejas and Arjun not only need a chance to perform but also require a long-term and sustained backing to become world beaters. In arriving at this conclusion, an absolutely viable and justifiable one at that, Sitharaman would have scythed through layers of smoke and mirrors power struggles putting an end to decades of being dependent on imported equipment that makes us feel good in the short run but hollow us out in the longer run and puts our national security for future generations in complete jeopardy. There is still hope since the Indian political system and its leaders, with all its schisms, petty politics and ugly warts and pimples, do occasionally come together when it’s a question of national security. One need not look too far back into history to see the last time such an event took place. The Sukhoi 30 MKI deal of the 1990s brought together Narasimha Rao, Atal Bihari Vajpayee and the unlikely Mulayam Singh Yadav as the defence minister to secure India’s air superiority in the decades to come. In backing Tejas and Arjun as two capable and effective defence platforms for securing the military future of India, Sitharaman would still be making a decision purely on technical parameters, but she might still be left wondering why such the smear campaign against these two platforms is so intense and concerted. After all, such a campaign never took place against the induction of long range or ballistic indigenous missiles or other sub-systems associated with it. The fact that the India couldn’t really shop in the global arms bazaar was one reason, but that still doesn’t explain why such campaigns against Indian missiles like surface-to-air Akash and Trishul, anti-tank Nag, air-to-air Akash or even the supersonic cruise missile Brahmos and its subsonic cousin Nirbhay have not been this intense or concerted. Therein lies the second myth that Sitharaman needs to understand and unpack to completely see how her decision on these two platforms will have a direct impact on the way India’s development trajectory is going to trace itself against an increasingly tumultuous global backdrop. The second myth is about technology transfer and its seemingly equal terms between the technology giver and the technology receiver. This myth has to be positioned against the backdrop of the current geopolitical ecosystem of no permanent friends and more or less no permanent enemies. The Cold War era of Russians readily transferring aviation technology for producing MiG series of aircraft no longer holds true. A senior scientist who is a Padma Shri recipient for leading purely Indian efforts for the development of a technology with military applications for the future that cannot yet be named asked me this simple question when I was digging his brain on the politics, economics and the mechanisms of high technology transfer. “Would you part with the Mars Orbital Mission (MOM) technology with anyone?” I said no. He asked me a follow-up question. “Why would a Lockheed-Martin, Boeing, Mikoyan, SAAB or Dasault part with its critical technologies and source codes? They may give you some parts of it, but they will retain the real core,” he said. “There are certain things that we will have to do ourselves and protect with our lives. That’s what will create true national security.” This highly qualified scientist knows what he is saying. And, for people who understand that particular world, it would interesting to know that for a large part of his life this scientist was placed in several foreign countries as the India’s official representative of the khadi and cottage industries. In that respect, Tejas and Arjun are decades of hard work in accumulating and developing technologies that have now reached the critical mass to create an explosive growth in the manufacturing and industrial sectors. It’s this potential that’s scaring the global powers that want India to grow for the massive market opportunities that it provides, but in a manner that it’s still dependent of foreign intellectual property rights and patents regime. This is where Sitharaman, and especially Modi, has to look eastwards and take a leaf or three, or even the entire book, from China. It isn’t only for parochial reasons that developed countries closely guard their secrets in the aviation sector and the tank building industries. These two specific industries are like the sorcerer’s stones for kick-starting the civilian manufacturing and industrial sector. Every single Chinese sectoral growth story of the last three decades – from electronics, mobile phones, digital display systems, electronic commerce, drones to high-strength steel, high-speed rail engines and massive agricultural and farming equipment – can be traced back to China’s legal and not so legal efforts at acquiring critical technologies and building up the foundation for the aviation industry and an indigenous tank designing and manufacturing capacity. It’s again not a coincidence that some of the world’s leading high technology manufacturing companies have both integrated military and civilian divisions. The Swedish giant SAAB manufactures cars, trucks and buses as well as fighter aircrafts and precision missile systems. The symbol that’s made BMW famous is actually a propeller, derived from its pre-World War avatar of being one of leading supplier of arms, aircraft and ammunition to Nazi Germany. China has at least ten large military industrial complexes – Aviation Industry Corp of China (AVIC), Norinco Group, China Electronics Technology Group Corp, China Shipbuilding Industry Corp (CSIC) and China Nuclear Engineering Group Co to name a few – that produce both military and civilian products. The interesting takeaway for both Modi and Sitharaman is that all the Chinese giants are substantially and strategically led by the State with the Chinese government being the majority investor and stakeholder. Most of the big-ticket growth trends that one associate with China – from massive hydroelectric power plants, solar farms to high-speed electric train engines – are all derived from the country’s massive state investments into the military industrial complex, particularly the aviation sector and the tank building industries. Three examples, two from India and one from China, should home in the point beyond any doubt about why some critical and strategic sectors, like space, aviation and tank building, should be aggressively controlled and led by state enterprises and massive government investments. India today is in the unlikely possession of one of the most advanced battery storage technologies in the world courtesy the Mars Orbital Mission (MOM). Elon Musk and Tesla’s interest in India in not just about sustainable future, massive markets and green economy, it’s also about acquiring the critical piece of battery storage technology that powered our MOM satellite. The second example is development of the GTX-35VS Kaveri Engine and its Kabini core by the Gas Turbine Research Establishment. Though the engine, for now, has failed to achieve its 95-115 kiloton thrust requirements, it’s really close to achieving those numbers. Yet Kaveri civilian derivatives are already being used to develop an indigenous marine propulsion engine, which will have a direct impact on making India’s ship building industry of world standards, and for developing high powered and high-capacity rail engines for India’s emerging freight corridors. Needless to say, India has been dependent on companies like ABB for high-powered rail engines. The third example, from China, is the development of its indigenous Beidou satellite navigation system that’s meant to help Chinese military aircraft enter the new age of networked warfare. It’s the third country, after US and Russia, to have its own Global Positioning System and the civilian implications of it are already felt in China ranging from pinpoint accuracy of weather forecast to massive increases in agricultural yields due to high-resolution satellite imaging helping in optimising cropping patterns and harvesting cycles. Tejas and Arjun have the potential to become our ‘China moment’ transforming every single aspect of Indian political economy, from our higher, technical and scientific education system to our research and development efforts, creating the necessary infrastructure for it and increasing the investment manifold. There is a lot to learn from our giant neighbour and this is one lesson that Modi and Sitharaman can imbibe and implement in true national spirit, rising above political compulsions and decisively moving away from soft approaches that have kept us addicted to foreign technologies and the power play of global corporations and their powerful government backers. India needs to adopt Tejas and Arjun in its totality and Modi can use this opportunity to enter the annals of Indian statesmen who will always be remembered with fondness and gratitude for taking the tough steps needed to secure India and its future generations. Very nice article, a keeper for sure. I will use NDA government's decision on Tejas and Arjun as a touchstone to decide whether this sarkar is nationalist or a traitor. The 2018 R-Day parade seemed to have some new stuff: Nirbhay missiles, and HAL helicopters in the flypast instead of the Russian ones...?